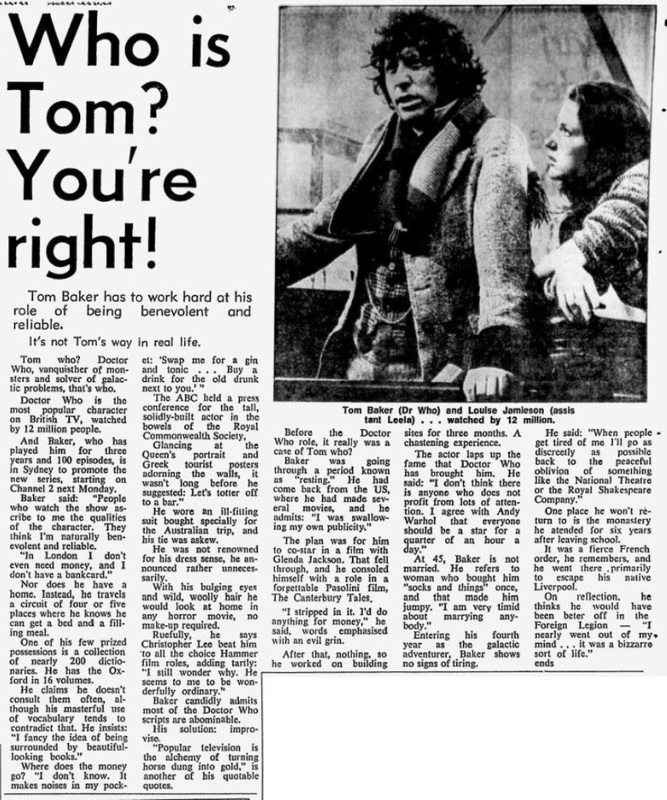 Tom Baker has to work hard at his role of being benevolent and reliable. It's not Tom's way in real life. Tom who? Doctor Who, vanquisher of monsters and solver of galactic problems, that's who. Doctor Who is the most popular character on British TV, watched by 12 million people. And Baker, who has played him for three years and 100 episodes, is in Sydney to promote the new series, starting on Channel 2 next Monday. Baker said: "People who watch the show ascribe to me the qualities of the character. They think I'm naturally benevolent and reliable. "In London I don't even need money, and I don't have a bankcard." Nor does he have a home, Instead, he travels a circuit of four or five places where he knows he can get a bed and a filling meal. One of his few prized possessions is a collection of nearly 200 dictionaries. He has the Oxford in 16 volumes. He claims he doesn't consult them often, although his masterful use of vocabulary tends to contradict that. He insists: "1 fancy the idea of being surrounded by beautiful-looking books." Where does the money go? "I don't know. It makes noises in my pocket: 'Swap me for a gin and tonic ... Buy a drink for the old drunk next to you.' "
The ABC held a press conference for the tall, solidly-built actor in the bowels of the Royal Commonwealth Society. Glancing	at the Queen's portrait and Greek tourist posters adorning the walls, it wasn't long before he suggested: Let's totter off to a bar." He wore an ill-filling suit bought specially for the Australian trip, and his tie was askew. He was not renowned for his dress sense, he announced rather unnecessarily. With his bulging eyes and wild, woolly hair he would look at home in any horror movie, no make-up required. Ruefully, he	says Christopher Lee beat him to all the choice Hammer film roles, adding tartly: 'I still wonder why. He seems to me to be wonderfully ordinary." Baker candidly admits most of the Doctor Who scripts are abominable. "Popular television is the alchemy of turning horse dung into gold," is another of his quotable quotes. Before the Doctor Who role, it really was a case of Tom who? Baker was going through a period known as "resting" He had come back from the US, where he had made several movies, and he admits: "I was swallowing my own publicity,"
"I stripped in it. I'd do anything for money," he said, words emphasised with an evil grin. After that, nothing, so he worked on building sites for three months. A chastening experience. The actor laps up the fame that Doctor Who has brought him. He said: "I don't think there is anyone who does not profit from lots of attention. I agree with Andy Warhol that everyone should be a star for a quarter of an hour a day." At 45, Baker is not married. He refers to woman who bought him "socks and things" once, and that made him jumpy. "I am very timid about marrying anybody." Entering his fourth year as the galactic adventurer, Baker shows no signs of tiring. He said: "When people get tired of me I'll go as discreetly as possible back to the peaceful oblivion of something like the National Theatre or the Royal Shakespeare Company." One place he won't return to is the monastery he atended for six years after leaving school. It was a fierce French order, he remembers, and he went there primarily to escape his native Liverpool. On reflection, he thinks he would have been better off in the Foreign Legion — "I nearly went out of my mind ... it was a bizzarre sort of life." Caption: TOM Baker (Dr Who) and Louise Jamieson (assistant Leela) ... watched by 12 million. APA 6th ed. : (1979-02-11). Who is Tom? You're right!. The Sydney Morning Herald . MLA 7th ed. : "Who is Tom? You're right!." The Sydney Morning Herald [add city] 1979-02-11. Print. Turabian: "Who is Tom? You're right!." The Sydney Morning Herald, 1979-02-11, section, edition. This page was last modified on 16 August 2014, at 14:11.